“Every horror you’ve seen on the screen grows pale beside the horror of The Black Scorpion,” claims one of the film’s taglines. True, schlock galore, but as a Scorpio, I was astrologically compelled to review this one. Richard Denning, who in 1954 starred in Creature from the Black Lagoon, is Dr. Hank Scott, an American geologist studying the terrain outside Mexico City after an earthquake and volcano rocked the countryside. Dr. Arturo Ramos, a Mexican geology professor, accompanies Scott into the arid landscape. After surveying a village and discovering a corpse and devastation, Teresa Alvarez appears, an attractive rancher whose cattle are mysteriously missing. She befriends the duo and helps them and local villagers manage the disasters. The trio learns the natural disasters shook an enormous cavern and awakened an army of giant scorpions partly responsible for the destruction. Scott and Ramos investigate the beasts’ lair, solicit help from a toxicologist and government officials, and battle the killer arachnids to save the countryside and Mexico City from carnage. 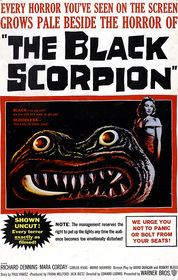 The Black Scorpion is another installment in the giant bug, reptile, and arachnid craze that infiltrated 1950s cinema. However, unlike its peers, The Black Scorpion features the special effects and stop-motion animation of Willis O’Brien, whose pioneering techniques in The Lost World (1925), King Kong (1933), Son of Kong (1933), and Mighty Joe Young (1949), among others, earned him worldwide recognition as a masterful animator and visual effects wizard. Having focused mostly on dinosaurs and reptilian beasts, The Black Scorpion marks O’Brien’s only foray into giant arachnids or insects. Without venomous stingers, real scorpions, with their segmented bodies and tails, slow crawls, and inconspicuous, nocturnal movements are frightening. With those stingers, lethal killers they become, especially when exponentially increased in size. With assistant Pete Peterson, O’Brien’s animation work adeptly recreates that nightmarish creepiness. His scorpions are exactly what one expects: unnerving creepy-crawlies that will terrorize the bravest soul’s dreams. Their movements from a distance are realistic: their stings and crawling motions, both forward and backwards, hauntingly replicate those of real scorpions. O’Brien’s monsters come in bunches, which is equally unsettling; they move with graceful stealth; grab and toss people, cars, and trains with their pincers; and are ruled by one large scorpion that controls its minions with toxic intimidation and packs the deadliest sting. O’Brien’s famous protégé, Ray Harryhausen, found even more acclaim as a stop-motion special effects genius, and he attributes O’Brien as his greatest mentor. The DVD boasts short but interesting features about Harryhausen and O’Brien’s relationship and obscure animation footage from Peterson’s Las Vegas Monster and Beetlemen. Fans of stop-motion minutia and these unique artists will enjoy these treats. 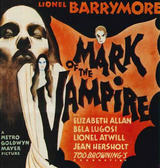 Their historical relevance, along with the DVD’s impressive quality, enhances the film’s lowbrow feel. The film shares parallels to its predecessors, mainly the original King Kong and 1954’s Them!. Like those films, The Black Scorpion’s “cavern sequence” occurs at the film’s midpoint and is an obvious homage to both classics. The trapdoor spider scene borrows creatively and practically from King Kong: the spider is an original model used in the 1933 classic’s notoriously deleted spider scene. Also, a huge worm-like monster with tentacles, which grapples with a scorpion, is a leftover prop from King Kong. The scorpions’ strange sounds are the same as the ants’ in Them!, and in each film, the collaboration of scientists, government officials, and military experts vanquishes the monsters. In an era riddled by world wars and Cold War paranoia, this illusion of teamwork was paramount in fostering a sense of public safety. Nevertheless, the film is littered with flaws provoking as many laughs as chills. As a sci-fi flick, the film’s science is dubious. Close ups of the scorpions’ ugly mugs reveal excessive, disgusting drool. Do scorpions drool? I doubt it since they live in arid climates where water is scarce. The knowledge displayed about volcanoes, earthquakes, fossilized scorpions, and arachnids will make most entomologists, arachnologists, or geologists cringe. More suspense in the first 30 minutes would have helped, and the inevitable love affair between Scott and Alvarez is forced, as usual, and corny at best. The poor, Mexican villagers speak English better than some Americans, and the film could also serve as a template for discontinuity: night scenes are juxtaposed with day scenes, and at one point, the Empire State Building is seen in the background when the final “Papa” scorpion is destroying… Mexico City! The film’s paltry budget hurt: filmmakers reportedly ran out of cash, so an empty traveling matte shot was used to depict the final scorpion as it trashed Mexico City, making it appear more like a giant X-ray stomping through the streets. Too many close ups of the beasts’ goofy faces and an excessive reliance on stock footage of the scorpions is also revealing. I enjoy these 1950s monster flicks for various reasons: one is the filmmakers’ audacity. Did they think they could pull this off? Even if the film is more comical than horrific, I appreciate its bravado. Although we know exactly what the monster is, where it lurks, and when it’s coming, viewers should still revel in such guilty pleasures. How can anyone resist a giant scorpion whacking tanks and helicopters in a Mexican football field? I know I couldn’t. Submitted by Christopher (not verified) on Sat, 2010-11-06 20:59. I always liked "The Black Scorpion", it is a fun movie to watch. I always liked the old 1950's monster movies, and I have most of them on DVD and VHS, including "The Black Scorpion" I especially like the cavern sequence. I don't care how corny some parts of the movie may be, I like it. 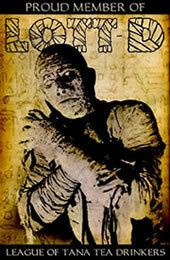 Anybody who likes old 1950's monster movies, will like this one. Submitted by vipin (not verified) on Mon, 2014-02-03 03:45.